A solid introduction to the Masculine and Feminine impulses within consciousness and how our inner experience of them can lead directly to greater and richer intimacy with our beloveds. Intimacy as a dynamic symbolizes the experience and desire to be authentically seen/received for one’s inherent uniqueness: “intimacy ~ in-to-me-you-see.” As an archetype, the function of intimacy is to unify these quintessential urges within the soul1 through a deep self-acknowledgement and acceptance of Other. These urges are expressions of the fundamental dualism found in creation. Within the human psyche, there is simultaneously the need to discover and explore our individualized Self – indicating a departure from where we come from as a being – and also the need to explore and merge with Other/All – indicating a return back into Source. The first urge symbolizes the masculine2, or yang principle3. Within this urge, we are seen for who we are, in our naked, raw, genetic, and shining individuality. We are exposed and accepted as worthy/lovable/powerful/good. This is the experience of being made a part of Nature and ultimately all Creation without compromise or adjustment of our inherent uniqueness. It is a cellular and ecstatic unforgetting of our unworthiness, insufficiency, and self-negating realities. We thus birth the capacity to both dissolve our false requirements for love (anger, helplessness, and indifference) and release our false ideas of security. These falsities are created early in life when we first experience separation from Mother, signaling that consciousness has been birthed within us. They are known as our sacred wounds; to heartfully progress through our lives integrating or ‘walking with’ our sacred wounds is an act of profound courage, and exposing entire vistas of the self, as if for the first time. This is the realization of the masculine impulse of the soul, to emerge boldly and be received in our boldness. Within the second archetype – to merge or return back into Source – we emotionally open to Other and allow Other to move into our inner protected places. We might think of this as the feminineurge4, which provides equally ample opportunities to address any sacred wounds to our feminine functioning. We experience the threatening ‘foreigner’ now as the ‘entrusted’. Our ability to connect with another no longer depends on the Other and therefore we choose more wisely those with whom we can grow. Our joining together harmonizes us into the broader identity of the union, one woven from individuals. We find that our thoughts become enhanced, our feelings vitalized and our past-obsessed concerns diminished. Over time and with practice, this merging ceases to not threaten our self-identity (ego); rather, it redefines it, re-positioning us as the center of a larger, more inclusive field or circle. This is the second soul impulse satisfied, the desire to be absorbed back into Source. With both impulses now fulfilled, a type of alchemy can occur wherein the Lover and the Loved transcend their human hosts. They are observed for what they actually are: divine confluences of merged intelligence(s) inhabiting the human electro-biological vessel. Each human vessel becomes a conduit for Love itself, whether s/he is in the role of giver or receiver of that Love. The fearful need to know “who I am”, “what is happening” or “what I should do” drops away. The individual’s consciousness, or sphere of awareness, releases from the constricting tightness of ego definition. It instead resides as if in a cresting wave of movement, motivated not by him/herself but by the Greater Mind/Unified Heart of the couple. In this way, true intimacy breeds a supra-personal experience formed from the laws of matter (physical vessel) but no longer bound by them (greater realized heart). It is interesting to note that the wounds we carry are the very soil and seeds of our wisdom. Reconciling to our life situations – the trauma and conditioning of our past – with compassion and without denial or victimization, forges new space for our hidden longing to arise. The ancient Jewish, African, Egyptian, Essene, Celtic, Christian and Sufi masters poeticized this longing. Today, it can become for us an ongoing resource of connection and truth. Indeed, it is in this longing that the urges of the soul are reconciled. 1 The Soul celestially magnetizes the etheric, astral, mental, emotional and physical characteristics of the individual into a complex and interrelated system of manifestations, tendencies, references, and contexts. It is the only true rudder of an individual’s incarnational experience that maintains alignment with the personal destiny. It guides and steers the individual to create and re-create the required experiences in the right timing for its eventual arising and supplanting the ego as the ‘captain of the ship’. As this transition occurs, the self-identity (ego) is increasingly sublimated to the will of the soul until that will is acknowledged and entrusted to guide the life consciously in all matters. 3 Use of “masculine” and “feminine” do not imply gender, but the spiritual impulses co-animating all life. 4 The following description of femininity is mine and is a working model. “It is the source of the impulse to retract, to return, to move inward; to dissolve uniqueness into a totality of sameness; to draw all with which it is in relationship into itself. It is the origin of the cyclic nature of physical existence. The feminine part of things is so ubiquitous as to be both invisible and unknowable. It is both the source of and the final resting place for the essential vitality of creation. The Feminine qualities arise from its archetypal predisposition to relate, to contain and to live/die. Femininity can be jealous, rageful, intensely myopic, parasitic, and both threatenable and protective simultaneously. It also gives rise to: conceding, harmonizing, accommodating, compassion, receptivity, inclusiveness producing far-seeingness, essential and unending nurturance, dark balance, and non-differentiation. 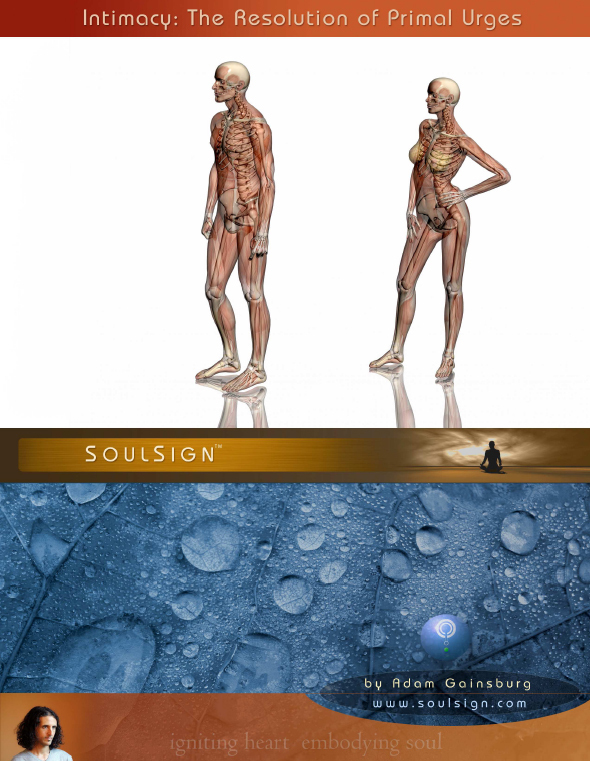 For more essays and shorter articles, including a sophisticated examination of the Masculine and Feminine principles in consciousness, visit Soulsign.com/articles.